Some responses come automatically, like reflexes. Others vary with circumstance and experience. A once-delicious smell can be easily overlooked during a stressful moment or when it calls to mind a bout of food poisoning, for instance. This happens because, within the brain, molecules known as neuromodulators reroute information about that odor. New research at The Rockefeller University takes advantage of the simple architecture within the fruit fly brain to examine how one such molecule, dopamine, acts like an operator at a switchboard. The results, published December 17 in Cell, show how it changes the flow of information, the basis for flexibility in behavior. Because a fly’s brain is much simpler than a mammal’s, these insects are important for neuroscience. 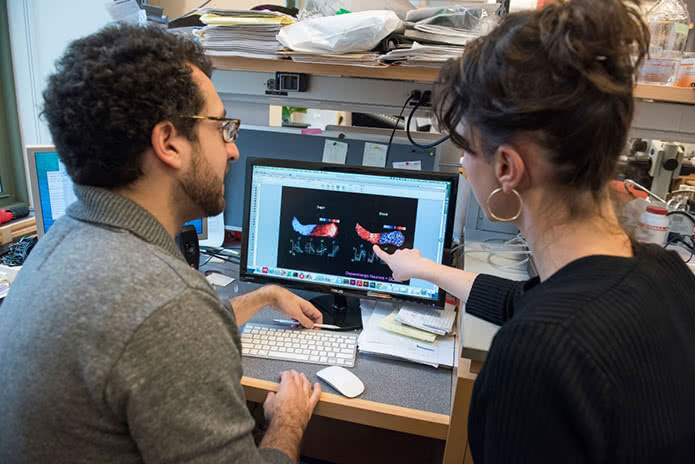 Vanessa Ruta (left), the study’s senior author, and first author Raphael Cohn (right) used flies to better understand flexible behavior—that is, why the same stimulus doesn’t always produce the same response. 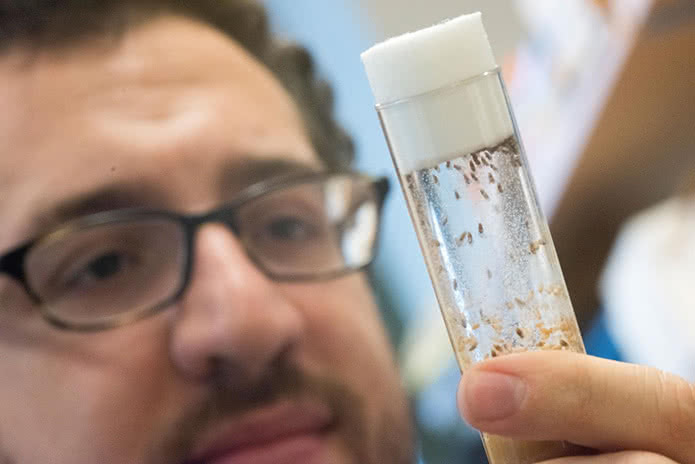 Flies also make good experimental subjects because those with special traits can be bred and raised in merely two weeks. Cohn (above) rears them in the lab. For this study, he and Ruta wanted to know how the insect’s experience, both past and present, could shape how its brain processes an odor. 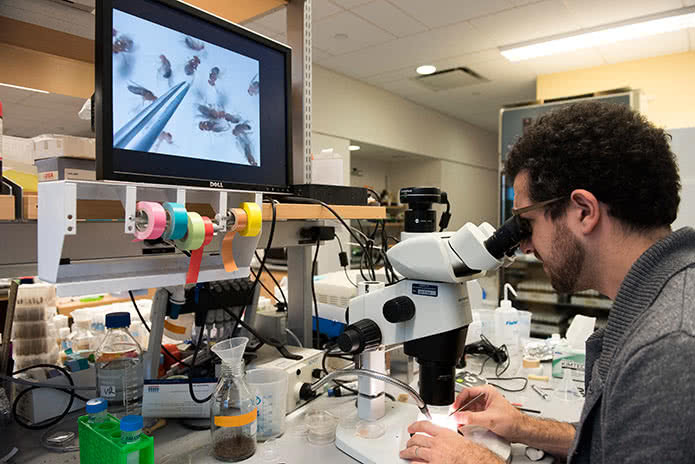 To visualize a fly’s neural activity, the researchers attach it to a microscope slide by its head, which is only a few 100 microns (one millionth of a meter) across. The procedure takes a lot of practice, Cohn says. He uses putty near the slide to stabilize his hands. 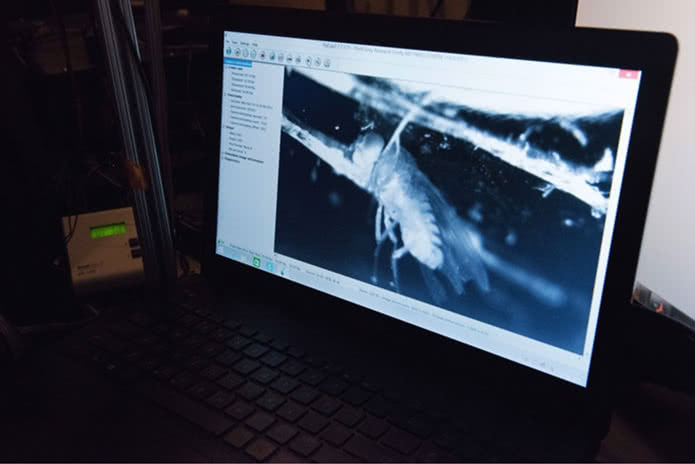 Once on slides, the flies can be imaged in a powerful laser-based microscope (as shown on screen above), which provides precise, three-dimensional information from within the fly’s brain. In this case, the researchers were interested in an odor-processing brain center known as the mushroom body. Three types of neurons come together in the mushroom body (grey). Branches of Kenyon cells (blue) carry information through this brain center’s compartments, where they connect to dopamine-producing neurons (pink) and to output neurons (green), which signal to other parts of the brain. The Kenyon cell makes connections (bright dots) to these other neurons as it travels through the mushroom body. Even though they come from the same cell, the signals sent out vary depending on the location of the connection. To better understand the activity of dopamine neurons within the mushroom body, the researchers gave the flies positive and negative stimuli. 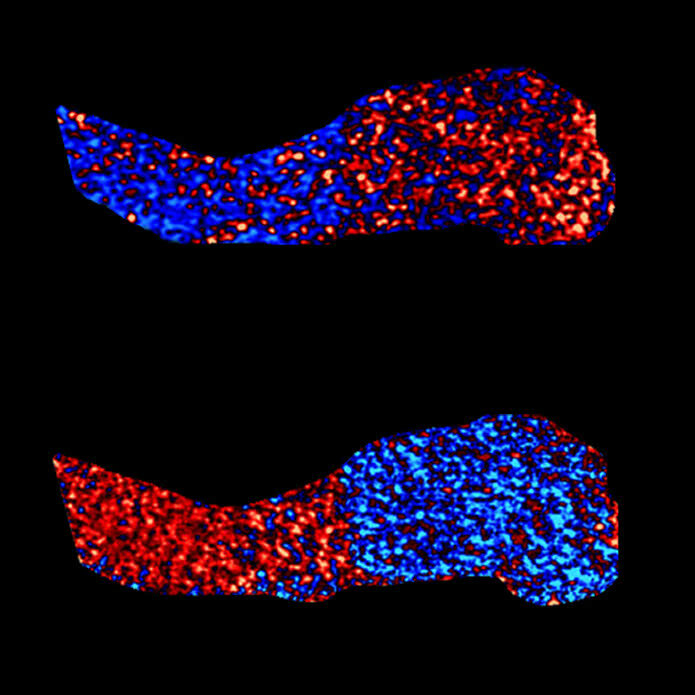 When they received sugar (left, on screen), the neurons in the second two compartments became active (red); meanwhile the first two compartments responded to the shock (right). A similar pattern emerged even without a stimulus. Dopamine neurons in opposing compartments became active when the fly was still versus flailing its legs, suggesting the activity of dopamine neurons reflects a fly’s internal state, not just external factors. 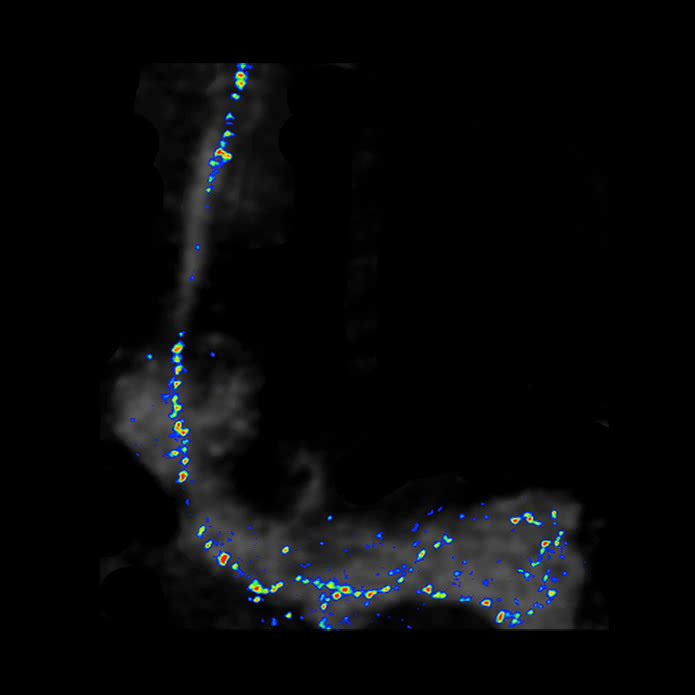 Ultimately, they found that activity by dopamine neurons in particular compartments (top) switches on Kenyon cell connections (middle), rerouting information to the output neurons (bottom). This alters the messages relayed to other parts of the brain, and, potentially, a response to an odor. The region, known as the mushroom body because of its shape, is responsible for a fly’s ability to learn to associate an odor with a reward or a punishment. Ruta, first author Raphael Cohn, a graduate student in the lab, and co-author Ianessa Morrante, were also interested in how the animal’s internal state—whether it was active or quiet, for instance—might influence dopamine, and as a result, information processing. The simple wiring of the fly’s mushroom body made it an ideal subject; a similar study would have been very challenging in the more complex mammalian brain. Signals from the fly’s nose, its antennae, travel into the mushroom body via the branches of neurons known as Kenyon cells. These branches traverse distinct compartments, and within each compartment they connect both with dopamine-producing neurons and with output neurons, which signal to other parts of the brain. While the human brain does not have a mushroom body, it does have dopamine. This neurotransmitter is present throughout the animal kingdom, and is known to play a number of important roles in human brain function, including in learning and motivation, where it functions as a neuromodulator. 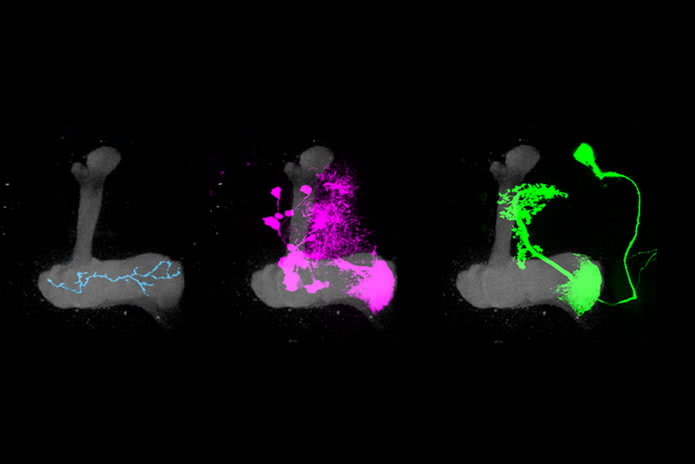 In their experiments, Ruta and her collaborators found that dopamine neurons reaching into two of four compartments became active when the fly was given a tasty sugar solution, while the other two became active when it experienced a briefly painful shock. The same reciprocal pattern of activity showed up while the fly was attached to the microscope slide, either motionless or flailing its legs wildly, with no outside stimulus. The latter result confirmed the dopamine signaling isn’t just involved in learning; it is linked to a fly’s internal state. “It appears these pathways create a beautiful moment-by-moment representation of the animal’s ongoing experience, generating much more complex and rich patterns than was previously appreciated,” Ruta says. To better understand the interactions among neurons in the mushroom body, they engineered Kenyon cells so their terminal ends at synapses glowed as a result of signaling. 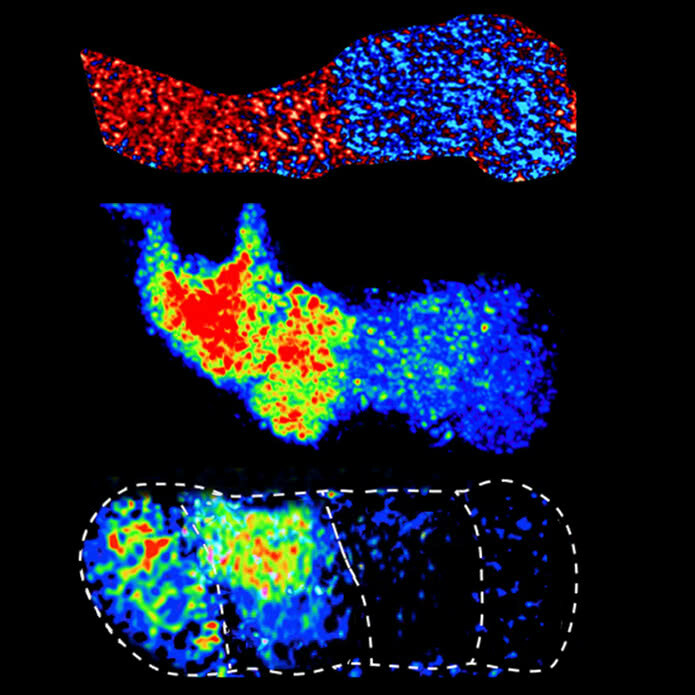 This revealed that the same Kenyon cell may or may not send a signal to the output neurons depending on the compartment in which the two come together. They also found that the dopamine neurons determine whether that signal is sent. This discovery quite likely parallels the action of dopamine in the human brain, the researchers say.